"Species that share the same limiting resource—in this case wheat plants—normally are expected to compete with each other for that resource," she said. "But we found that the order of arrival to the host plant affects the outcome of the ecological interactions." 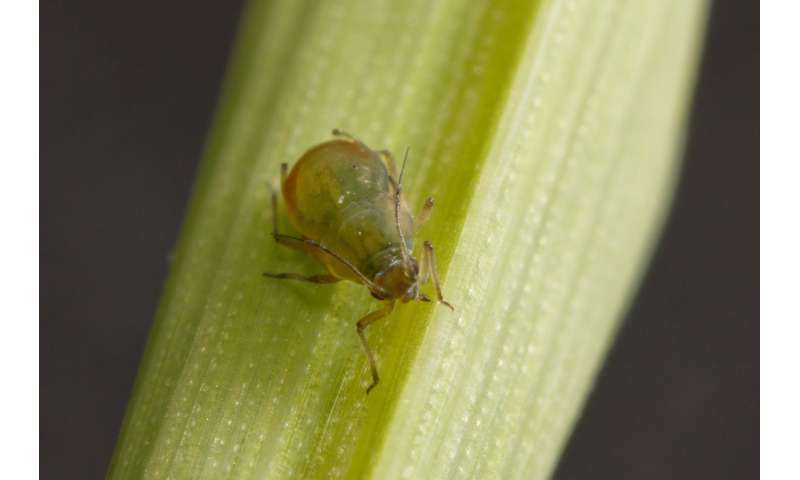 Porras explained that in the absence of viruses, the aphid species Rhopalosiphum padi typically is the first to invade wheat plants, while Rhopalosiphum maidis arrives later. If the opposite occurs—R. maidis arrives first—then the success of R. padi is hindered. However, when R. padi infects the plant with barley yellow dwarf virus (BYDV), two things change: the success of late-arriving R. maidis increases and, if R. maidis arrives first, then late-arriving R. padi has no trouble colonizing the plant. "We placed electronic micro-sensors on individual insects and plants to measure feeding events with precision," said Porras. "Specifically, we measured two key parameters of aphid foraging—the time taken by aphids to reach the phloem (the nutritious plant sap), and the duration of ingestions." The team extracted viruses from plants, and used ELISA tests—which detect specific antibodies—to identify the types of viruses within the plants. In addition, they used a variety of gas chromatography and mass spectrometry techniques to analyze the plants for nutrient content.